Salesforce: Should the Force be with you? in recent newsletter issues, then maybe the many ads for it on popular web sites have caught your eye. At a glance your first reaction is most likely, “I’m not in sales so this can’t be a product for me.” If you can get past the name, which, truthfully is a bit misleading, Salesforce is something every business and non-profit should at least look into, as it’s so much more than what the name would imply. At its core, Salesforce is what it sounds like, a Customer Relationship Management (CRM) solution. Used by businesses of all sizes and industries to track contacts, leads, opportunities and sales-related data points. But unlike most CRMs where functionality is focused around prospecting and closing sales deals, Salesforce and the related Force.com platform can be an end-to-end solution for sales, customer service, project management, and even accounting. A variety of off-the-shelf components and products are available as well as its ability to creating custom applications from the ground up, similar to a Microsoft .NET and SQL Server or PHP/MySQL, Salesforce can literally “do it all”. While Software as a Service (SaaS) and cloud computing are mentioned everywhere these days, it really wasn’t long ago when neither were part of the vocabulary. Salesforce had its initial breakthrough in 1999 and quickly became the biggest player in the SaaS marketplace. Prior to SaaS, software was typically installed locally on a company’s servers and workstations. Upgrades and updates had to be installed from disks that came in the mail or downloaded from a company’s site. SaaS changed the name of the game in that no software is needed to be installed or downloaded - solutions could be accessed directly over the Internet. Create a user name and password and you’re good to go. No waiting for your tech guy to do an install, or worrying about compatibility with your computer’s operating system, or budgeting for the next release cycle. The program and data is hosted in the cloud and accessible through a browser, any browser, or mobile device, you have your data wherever and whenever you need it – without the hassles of on-premise products. Because SaaS, and Salesforce specifically, have caught on so quickly, the market has attracted many product developers. Developers create products and they are accessible through the AppExchange, an online marketplace for Force.com-based applications that can be integrated with the core Sales and Service cloud products that Salesforce makes available. This enables you to extend your data and use of it across multiple departments and functions. From integration of your Salesforce data with Microsoft Outlook, to marketing automation with common tools like Google AdWords, to full-scale apps for accounting and HR, you can search the vast AppExchange for just about any common business database need, and you’re bound to find a suitable solution. In addition to enterprise and small/mid-sized business, non-profits and similar orgs are well represented in the Salesforce community. Not only can the Enterprise version be obtained for free or steep discount by qualified organizations, there are also plenty of uses and apps for non-profits to make Salesforce the platform of choice. The Salesforce Foundation offers donations of the product for eligible non-profits, higher education, K-12 and religious institutions, allowing organizations to make use of the popular SaaS solution at a fraction of the cost of what for-profit companies pay. Combine this with the vast array of AppExchange products available, and it would be hard to put a cap on the number of ways an institution could use this platform. 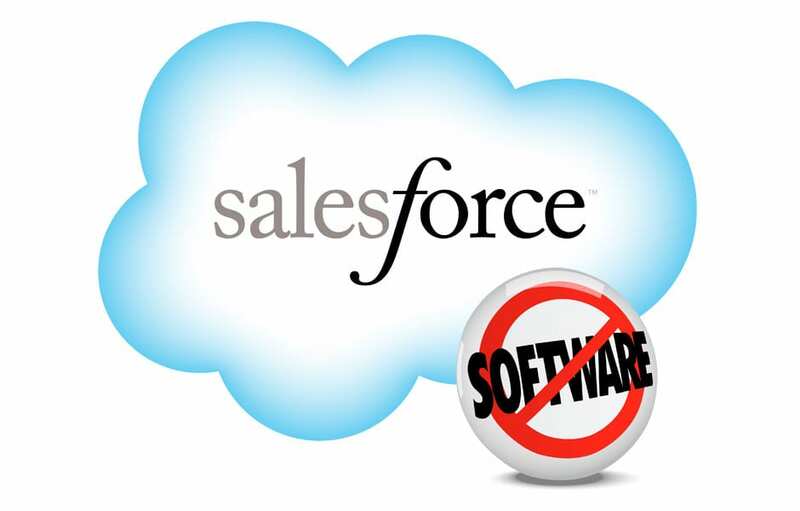 Like anything, Salesforce and Force.com are not for every business or budget. The per user per month cost for the for-profit seats can add up quickly and is perpetual, so companies need to take a long look at the ROI relative to 100% custom-developed web solutions and rapid deployment client-server products before selecting the Salesforce path. But, for hassle-free, off-the-shelf functionality that can be modified by even non-programmers fairly quick few products can compare to Salesforce today. As a Registered Partner and custom developer of Salesforce solutions, along with a number of other technologies, IT Solutions is well-poised to help you evaluate the force of Salesforce and help you decide if it’s a fit for your business. Interested in knowing more? Contact Jim Higgins at 215-886-7166 to set up a complimentary consultation. If you haven’t noticed the posts about Salesforce.com in recent newsletter issues, then maybe the many ads for it on popular web sites have caught your eye. At a glance your first reaction is most likely, “I’m not in sales so this can’t be a product for me.” If you can get past the name, which, truthfully is a bit misleading, Salesforce is something every business and non-profit should at least look into, as it’s so much more than what the name would imply. At its core, Salesforce is what it sounds like, a Customer Relationship Management (CRM) solution. Used by businesses of all sizes and industries to track contacts, leads, opportunities and sales-related data points. But unlike most CRMs where functionality is focused around prospecting and closing sales deals, Salesforce and the related Force.com platform can be an end-to-end solution for sales, customer service, project management, and even accounting. A variety of off-the-shelf components and products are available as well as its ability to creating custom applications from the ground up, similar to a Microsoft .NET and SQL Server or PHP/MySQL, Salesforce can literally “do it all”. While Software as a Service (SaaS) and cloud computing are mentioned everywhere these days, it really wasn’t long ago when neither were part of the vocabulary.